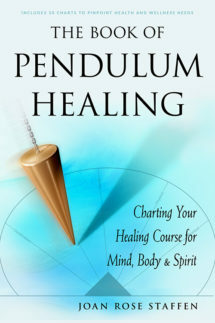 The Book of Pendulum Healing, suitable for beginners and adepts alike, offers clear, concise instructions for using ancient dowsing techniques, a modern pendulum, and 30 interrelated intuitive healing charts as a spiritual guidance system. The lessons provided are practical–the dowsing process provides concrete, visible-to-the-eye answers and solutions–and other easy-to-learn healing techniques such as communication with the angelic realm, affirmative prayer, meditation, and aura clearing are also included. This profound system opens one’s mind to inner intuition and wisdom and addresses many key intellectual, emotional, physical, and spiritual issues.